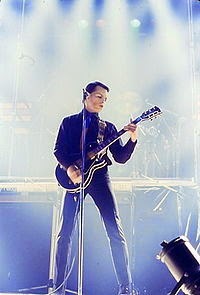 Gary Numan followed up his debut national tour of the UK in the Autumn of 1979 by taking the Touring Principle tour into Europe and then across the world. By early 1980 he was touring the USA and Canada. This set features some changes from the UK tour, including an early version of Remind Me To Smile, which featured on the Telekon album released 8 months later. I can't remember if this was originally an FM recording or a soundboard - sounds to me like a soundboard as its quite flat (or it was before I EQ'ed it) but its not the complete gig either, which is unusual (but not unknown) for soundboards. Anyway, I tidied it up a bit and its a great addition to any Numan collection with some raw sounding synthing all the way through!